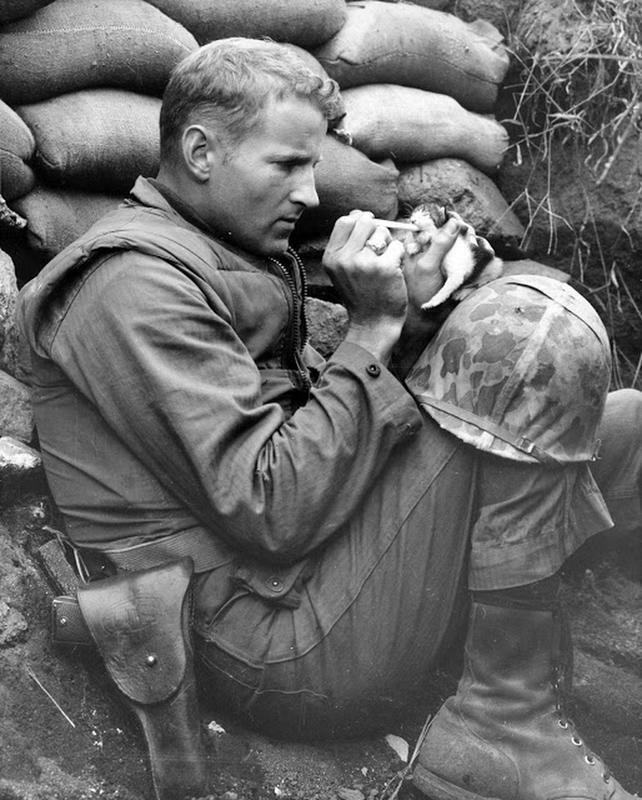 In the middle of the Korean War, this kitten found herself an orphan. Luckily, she found her way into the hands of Marine Sergeant Frank Praytor. He adopted the two-week-old kitten and gave her the name “Miss Hap” because, he explained, “she was born at the wrong place at the wrong time”. There’s a juxtaposition between the soldier and the human. He’s dressed for war but hasn’t lost the ability to care for another living creature. It was circulated that Miss Hap’s was killed by a mortar barrage near Bunker Hill. That was not true. In a 2009 article in The Graybeards Sergeant Praytor, stated that mother was shot by a Marine up the line because of her yeowling. Since that would have caused negative reactions, Corps publicity told the mortar barrage story instead. Miss Hap was one of two orphaned kittens. Sergeant Praytor took care of her while the other was given to another man – who rolled over in his sleep and accidentally killed it. The photo above was taken by Staff Sergeant Martin Riley. Sergeant Praytor was feeding Miss Hap slightly watered-down canned milk with a medicine dropper. She was later weaned onto meat out of “C” ration cans. In 2010, Praytor wrote, "Miss Hap was weaned on meat out of C rations and grew into a big girl who thought I was her father. When I left Korea, I left her in the care of another Marine. When I returned in '55, she was alive and well. At 83, I'm still saving orphans. Have two cats, Molly and Max. They never leave the house." Seward’s Folly: Who’s Laughing Now?